This work has three aspects, birthing training and kits, education and clean drinking water. In rural PNG the mortality rate in childbirth is 1:7, with a maternal mortality rate of 1 in every 120 live births. The need for aid here is great. From the first 100 Birthing Kits that were distributed we saw a significant reduction in both maternal deaths and infant deaths. Currently for the approx. 55,000 Kiriwinans on the Island there is NO Doctor and the two trained Midwives have recently retired. Caring for Kiriwina distributes birthing Kits across the Island and to surrounding remote Islands. We also distribute torches, warm clothing and aspirators. Each Birthing Kit includes a Birth Certificate form, as birth records are not officially kept by the PNG Government. The Village Birth Attendants (VBAs), who make use of the Birthing Kits, require training in the use of the Kits and we are additionally fundraising to organise trainers from Australia to provide free training for these volunteers. After the success of our first Village Birth Attendant training program we are organising our second training trip which will include the same volunteers. Leaving TBA. Fundraising has started in earnest. 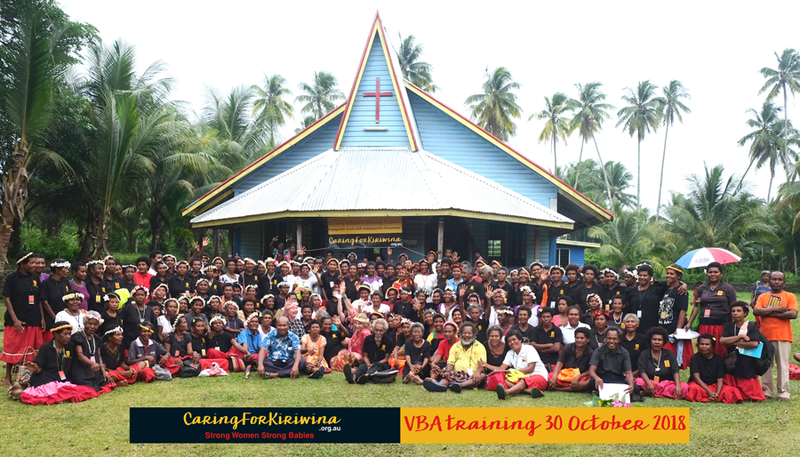 We are raising funds to allow two Kiriwinan women chosen by the VBA and Kiriwinan community to embark on an intensive three year Midwife training course at the POM SDA University. We need to raise approx. 65K in funding for the full three year course including accommodation and food. A very big commitment by all involved. We are researching shorter and more cost effective ways to allow a selection of VBA’s to continue to train. We are fundraising for our second trip taking two Australian registered midwife educators to travel to the island of Kiriwina on 4th August 2018 to facilitate an education program at one of the main villages after the enormous success of our first VBA Training Trip in April 2017. The program again will incorporate guidelines from the World Health Organisation Safe Childbirth initiative, and we anticipate that over 180 Village Birth Attendants (VBA’s) will be able to attend the five day course. In preparation for the journey to Kiriwina Shea and Jacqui identified through their research that women’s groups can dramatically reduce the number of maternal and newborn deaths in some of the world’s poorest communities. Shea and Jacqui utilised this information in the training by incorporating role playing and encouraging discussion of the local issues. Shea’s work with the Aboriginal community throughout Australia gave a strong platform for the aim of the education in Kiriwina with the main aim to give women information, confidence in decision making and encouraging support from families and the community. 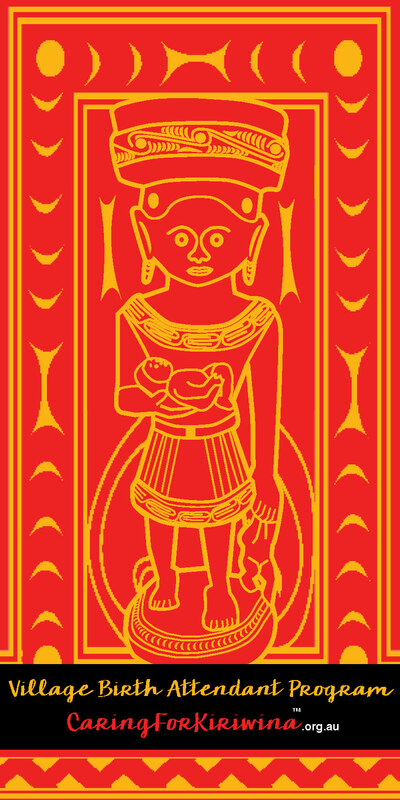 We developed culturally specific resource material printed in the Kiriwinan language as lanyards for the participants including Tips for Healthy Pregnancy; Tips For Healthy Birth; Warning Signs in Pregnancy; Warning Signs in Labour and Birth; Warning Signs After Birth and Warning Signs for Baby. A primer is a primary aid for teaching reading in your own language. Other primary aids such as graded simple reading texts are used to introduce young children to themes such as healthcare. 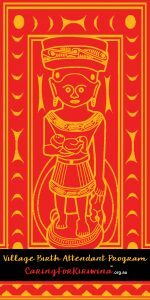 Ralph Lawton is giving his time to producing a Kiriwina Primer and other texts, with the help from donations these educational aids will be published. Donations will be used to cover costs of printing and distribution. We provide much needed school equipment, and help others distribute them to Kiriwina schools (which do not receive Government help at all for vernacular education). We are raising funds to promote the supply of clean drinking water. Kiriwina Island is flat, with no rivers and no naturally-occurring fresh drinking water. While the underground water table is easily accessed as it is shallow, it is of brackish quality and frequently not potable, although suitable for bathing (and is so used for the 55,000 Kiriwina inhabitants). The village toilets and household rubbish from about 80 villages contaminate it further. The PNG government has recently begun supplying corrugated iron roofing for some buildings to help in water collection, but no guttering, downpipe or tanks to aid the water collection. Caring for Kiriwina is trying to fund the supply of these essentials, from your gifts. 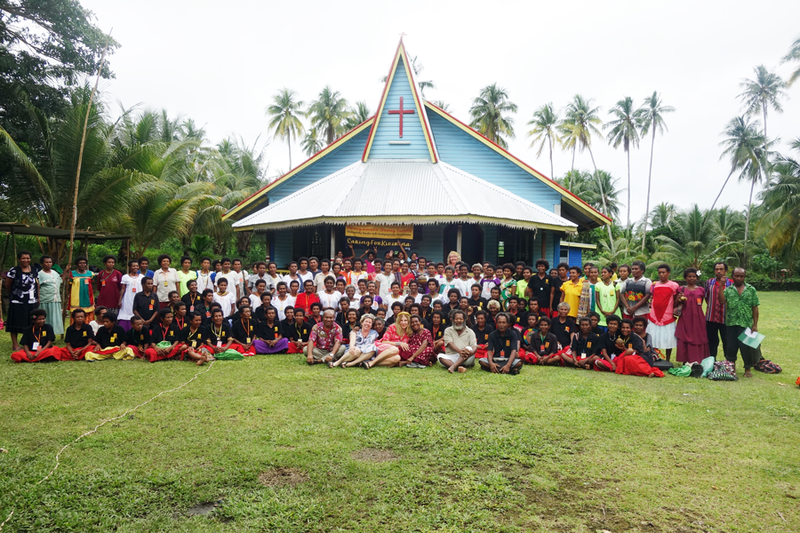 Donations and volunteers are crucial for the existence of Caring for Kiriwina. You can make sure that the Kiriwina people continue to benefit from our efforts on their behalf. Who can set a price on things like safe birthing, clean drinking water, and a basic education which enables children to read and write in their own language! Further, it is well known that the best students who go on to learn English are those already literate in their own native tongue, and this is where a country’s future leaders come. If we help them to begin right, ultimately we are ensuring a people’s future. It rests with us to keep Margaret Lawton’s vision alive. Caring for Kiriwina is doing this. And we rely on you.